Just when we start to think, "This is it!!!! pen manufactures should be out of innovative ideas by now. "A luxurious brand steps in to steal the show, and introduces a writing instrument that sweeps us off our feet. And at the first glance, a quick thought pops up in our head, "this is going to be the next addition to my collection". But what can we do, as pen enthusiasts we cannot separate ourselves from the mesmerizing magic of fine writing instruments. A recent release that caught my eye was the new Cross Peerless Citizen Special Edition. These special pens are an extension to classic Peerless 125 heritage, equally elegant but are garnished with a dash of modernism. The Cross Citizen collection is available in three special design, each decorated to reveal the allurement of three different cosmopolitan centers of the world; London, New York and Tokyo. Each pen features a traditional cigar shaped silhouette with etched motifs of these out worldly monuments and a Swarovski faceted cut crystal mounted on the top of the cap. This artistic collection from cross is sophistically designed to surpass the word "perfect" and offer a distinct penmanship experience. Cross Peerless London: The subtle design of the Cross Peerless London replicates timeless elegance of the Elizabeth Tower. The intricate detailing on the cap and the barrel of the pen brings out the charisma of the ancient monument and unveils the meticulous craftsmanship of Cross artisans. In fountain pen, a sturdy 23kt gold nib is fitted to offer a joyful writing experience, and to ameliorate things even more decent amount of space is separated between the nib and the barrel of the pen. The 23kt gold nib is available in fine and medium, and can be easily replaced according to user preference. Cross Peerless New York: Whether you are in a meeting, seminar or conference, if you have the new Cross Peerless New York you'll be the center of attraction. This elegant writer from Cross borrows its look from the architectural design of the New York’s Chrysler Building. The intricate details of the buildings are carefully etched on the body of the pen. This fine writer includes a conical cap with premium Swarovski crystal mounted on top. Its unparallel design is embellished with an 18kt rhodium plated nib and platinum plated trims to exhilarate the joy of writing. The nib option is available in fine and medium. Cross Peerless Tokyo: The new Cross Peerless Tokyo exhibits the sophistication and Modernism of Japan's tallest structure and center of broadcasting and communications, the Tokyo Skytree. Its hefty satin black profile encapsulates the eternal beauty of the building, and presents it in the form of a pen. Each pen is adorned by an 18kt rhodium plated gold nib that adapts to the users unique touch. So, as tough as the appearance of the pen is, the mechanism is smooth sailing and it doesn't take a lot of hard work to make it perform. For pen enthusiasts it will be hard to choose between these three mesmerizing series of writing instruments. 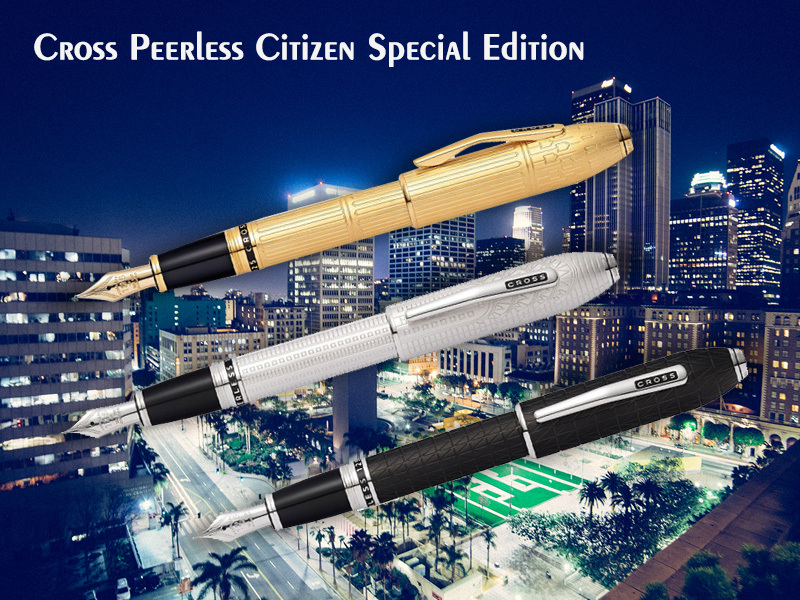 Each pen in the Cross Peerless Citizen collection manifests the distinct beauty of three important cities of the world. So, what Cross pen are you going to buy today? Choose the one that suits you the best and embark a new writing journey with these subtle writing instruments.